When I first worked out my little quirky leaf motif I knew I had to make a leafy crown out of it at some point – I just couldn’t find the right yarn at the hobby stores. I wanted it to be delicate and pretty, not bulky, but the yarns I tested didn’t fit the bill. 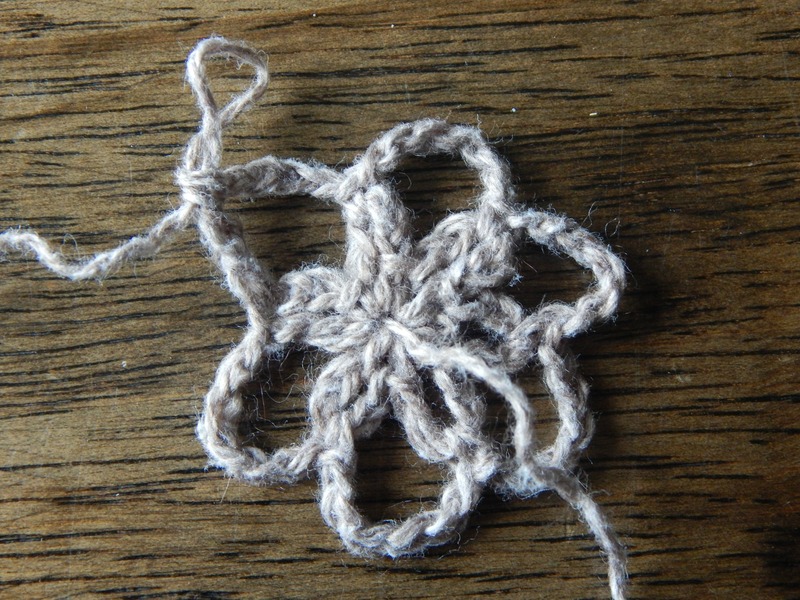 And then the very obvious solution hit me – use THREAD, not yarn, holding two strands together to make it bigger. Yay! So without further yammering, here’s the FREE crochet pattern for this fun leafy DIY floral crown. #10 cotton crochet thread – You will need 2 cones of either the same or coordinating colors, because the pattern is worked with the 2 threads held together. 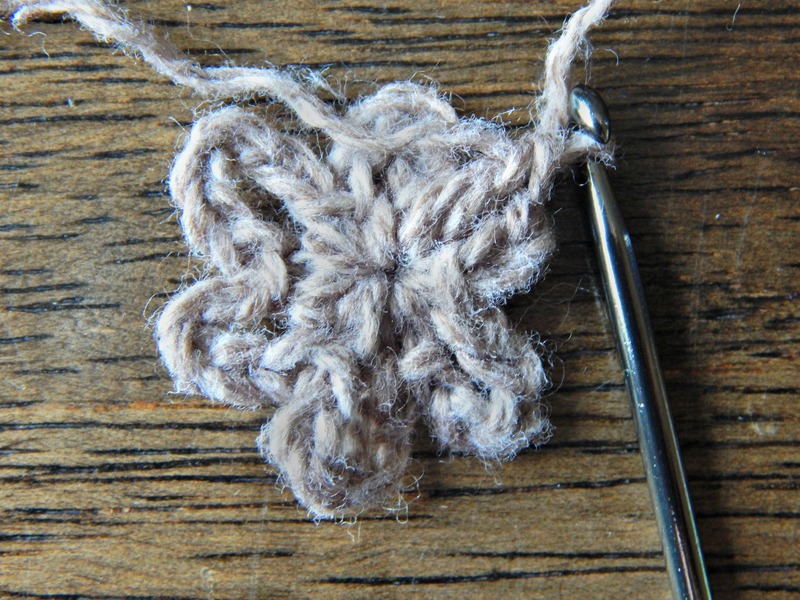 For a full photo tutorial on how to make the quirky crochet leaf, see this blog post. Grab both strands of cotton thread and form a slipknot. In the 3rd ch from the hook, work 4 dc. Work a ch-2 length picot in the top of the last dc. 3 hdc in the same st as the first 4 dc sts. Sl st in the 2nd ch of beg ch-2 on the leaf. Sl st into the 2nd ch st from the motif on your original chain, anchoring the back of your leaf. Repeat from Step 2 – you can vary the spacing of the leaves by adding or subtracting chain stitches in between, as long as you have a minimum of 5 ch sts. I like to randomize the chain length at anywhere between 8-12 stitches between leaves for a subtle organic look. I repeated 44 times, for a total of 45 leaves or 55″ in length, and made three in different colors! 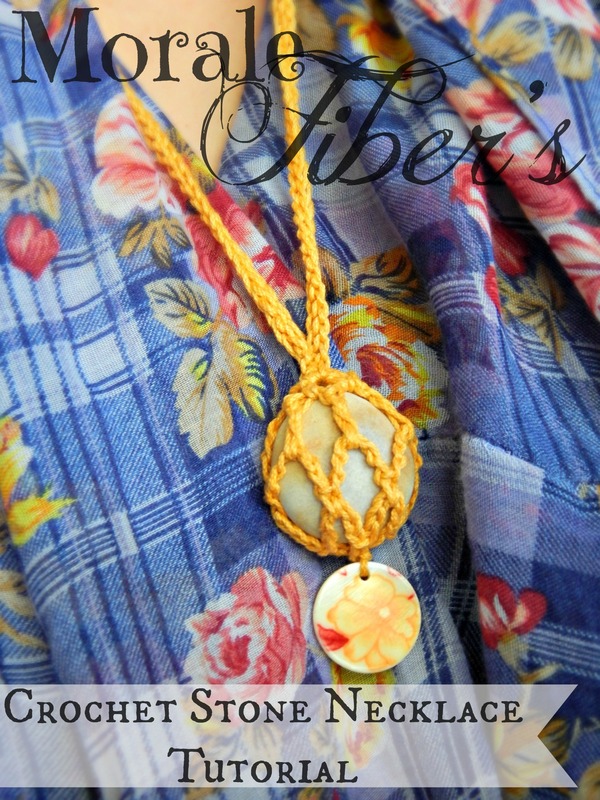 make shorter versions to create a choker necklace or double up the long version to make a lariat-style necklace. Like this! I’ve got a respectable amount of crochet thread hanging around currently so I know I’ll be making more of these garlands! The shawl I’m wearing is my original Ida Shawl crochet pattern! Sometimes I have to burn off my excess creative energy by doing something I can finish quickly! These wild textile jewelry pieces fit the bill, especially since I’ve been trying to clean my shamefully stuffed craft storage and shredding stockpiled t-shirts is a pretty effective method for me to do that. This tutorial is a guide for the refashion-centric among us, and you don’t even really need to be able to crochet to make it! 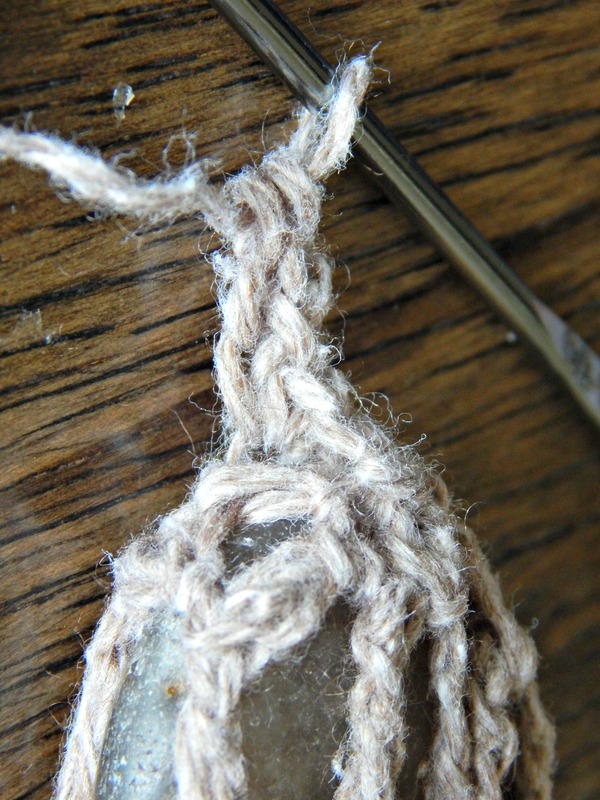 Only the simplest crochet stitch, the chain stitch, is necessary. It’s explained here for those who don’t know how. There are lots of different methods for cutting t-shirt yarn, and you don’t have to cut yours the same way as shown here, but this method is featured because you can use t-shirts with lots of seams (ex: Women’s fitted t-shirts). Of course, if you want to save yourself the trouble, you could just buy some commercially produced t-shirt yarn instead! Step 1: Lay out your T-shirt and cut up the side seams on both sides of the front and across the top. It’s okay to cut a little wonky to get extra material from the bust area below the collar, but I’ve found it’s best to keep in GENERALLY rectangle shaped. Step 2: Beginning with your wonky – cut side (or any side if you don’t have one) start cutting a strip about an inch in width. The goal is a thin-ish strand once you stretch the material. It can be a little more or a little less than an inch depending on the material, but be careful because if it’s too thin, it’ll break when stretched. Leave your strip attached by about an inch of uncut material. Step 3: Flip your t-shirt piece around and cut about an inch to the opposite side of the uncut end. Do this 3 or 4 more times to get a long uncut strand (for a small size) or 2-3 more times for larger t-shirts. It’s better to have more than you need than not enough, and in fact you could cut the entire piece of t-shirt material this way, but I don’t like to because cutting this way leaves tabs. Speaking of which…. Step 4: Once you’ve got your long piece, start gently stretching your strip to curl the material to make it round and yarn-like. Use a light touch at first! Now, to deal with those tabs created by zigzagging the material. Take your scissors and round those babies off, then stretch them a little more (be careful here – rounding the corners makes the fabric thin and therefore weak to stretching). Still a little messy, but stitching will mask that. Step 5: Set your long strip aside – I had almost 3 yards. Now lay out your remaining rectangle of t-shirt fabric and get one inch strips straight across, shearing them completely from the main fabric so that they are individual strips. Stretch each of these strips. For a standard amount of fringe, you’ll want to have 23-26 strips, so use cut out the back piece of the t-shirt and use it for more short strips if you have to. If you are using commercial yarn or a continuous strip in this step, cut your strands to DOUBLE the length you want your fringe to be. Step 6: Grab your hook and your long strand. 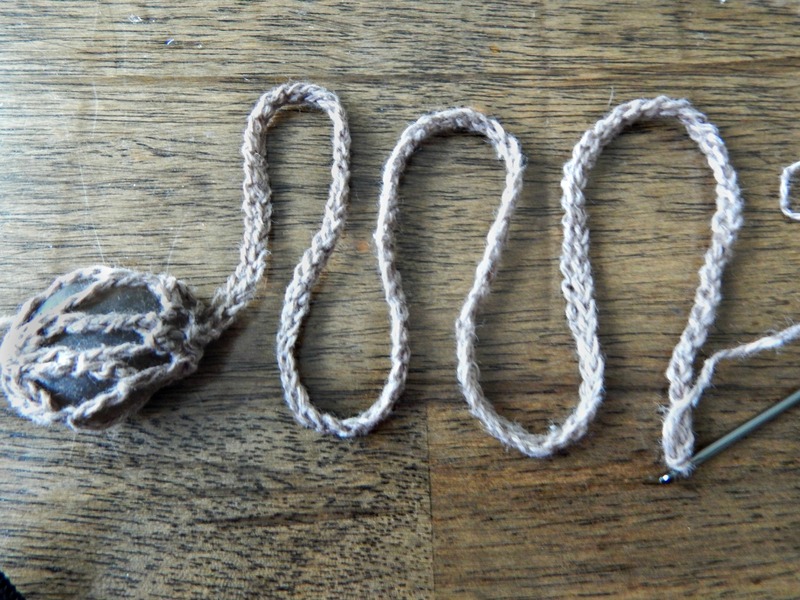 Leaving a tail of yarn about 10″ long, create a slipknot loop. With your hook in the loop, grab the long end of your yarn with the hook and pull it through the loop, leaving your hook in the middle of the new loop. One chain stitch made. Repeat until you have 25-ish chain stitches, or however long you need your chain to be to fit your neck. If you’re feeling adventurous, try using the Double Chain technique instead of the regular chain. I like to use this on the fringe chokers because it helps them lie flatter around the collarbone. Once you’ve completed your stitches, tie off (i.e – pull the rest of your strip out through the last loop), and leave a 10″ tail when cutting off excess yarn. If you complete your required stitches but don’t have a 10 inch tail left over, just tie it off for now. We can use a short strip to attach an adequate length of tie later. Step 7: Finally! Fringing time! Lay out your chain. Grab some of your short t-shirt strands and double them over. You might have some that are shorter than others – aesthetically I like those to be on the outside toward the shoulders but you might not care. Anyway, double those puppies over. Insert your hook into the loop on the bottom of your chain or double chain, from back to front, and catch the doubled side of your strand with the hook. Pull it through so you’ve got a loop. Now catch the loose ends of your short strand with the hook. Pull those through your loop completely. Tighten. Ta-Da! Now do that until you have fringed the entire choker, or at least the majority of it. Step 8: Attach extra ties at the end of your chain if you need to, for fastening around the neck. You could be done at this point, but I like to add a little knotwork around the top. To add knotwork, take two adjacent pairs of fringe and separate one strand from each pair (make sure the strands are also right next to each other). Pick up both strands and tie in a simple knot. Repeat across. These can be used as a base for adding even wilder decorations like beads, feathers, leather strips, chains, etc… But since I’m short on time, I’ll leave those for another day! That stylish bikini underneath the necklaces is also made from recycled materials. Check out my post, the Bindu Recycled Sweater Bikini, for more on that. My prime directive this Thanksgiving break was to get a new batch of handpainted wool dyed, dried, and stocked in my Etsy shop, which I totally did, check it out! This batch features a lot of muted earthy tones, I guess I was sort of in a wintry mindset. Get some holiday shopping done! This 15% off deal applies to EVERYTHING in my shop, including crochet patterns and handmade items! If completely awesome knit and yarn – themed jewelry is your style, you should check out Malojos, run by the same awesome lady who taught me how to spin correctly and thus re-launched my obsession with it. She’s running a 15% off sale too (check out the blog post in the previous link for details), and recently has pledged to donate a portion of her profits to the Southern Poverty Law Center. Shop small, do good, feel good! My favorite is her beautiful kitchener stitch instruction cuff. Perhaps you are a fan of pretty rocks? I know I am. 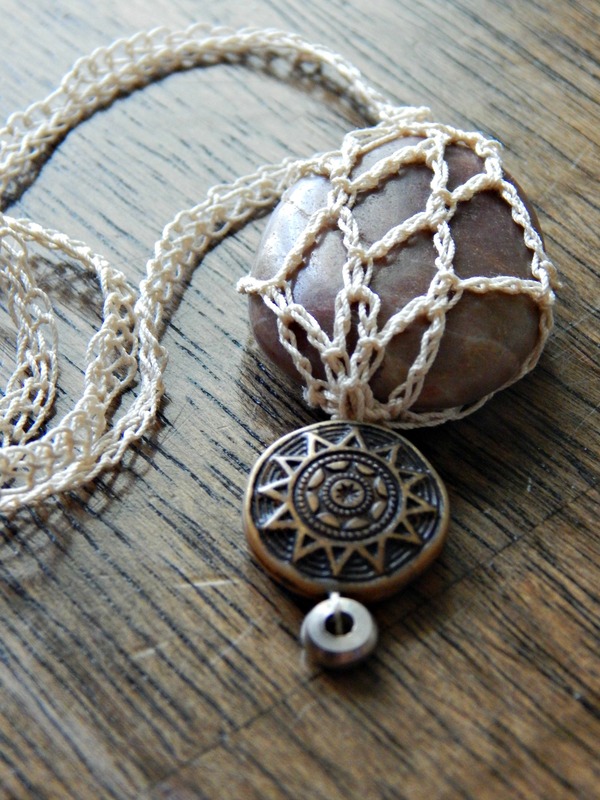 Take a look at Cherry Bones Arts, who does beautiful wire wrapping around a variety of stones. I own several of her pieces and get compliments every time I wear one! Does anyone else here have a Magpie-like tendency to grab shiny objects and stow them away? Tiny animal charms, small bells from wedding decorations, bits of broken jewelry (sometimes my own, sometimes from things I have found on the ground), smooth rocks… all stacked in old tea caddies and desk organizer trays in my drawers, on my shelves, and who knows where else. Because they’re pretty. Because they’re interesting. Because eventually they would be useful. And today they were. Warning: I went pic-heavy on this as GTFO. Because nothing is more interesting than pictures of rocks. 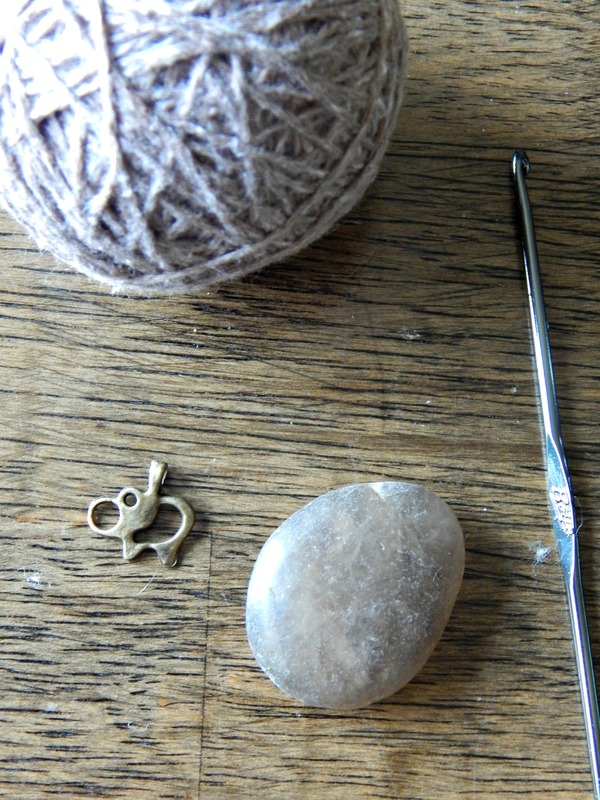 Start with your 3.25 hook and the lace weight yarn – later when you feel more confident in your stone-wrapping skills, you can move on to the tiny hook and thread. Rnd 2: (Ch 6, sc in the next ch-5 space) 5 times. Ch 3, treble in the top of the dc of the next ch-space. At this point you should test the fit of your stone. The loops should reach about one third to one half of the way up the stone unstretched with the “bottom” or fattest end resting in the center of the “flower” motif. 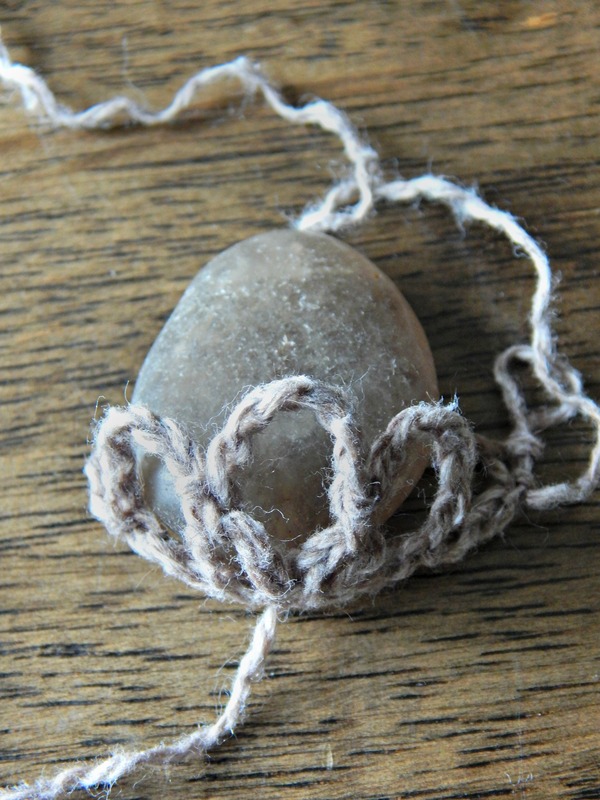 Since every stone is different and so is every crocheter, you may have to adjust your pattern to fit the stone better. Add a repeat of Round 2 or subtract it altogether to make the net smaller or larger. Since it’s a very small, quick motif, experimenting doesn’t take too long, but it does take some patience. Once you are satisfied, take your stone back out and continue with the next round. Rnd 3: Ch 4 – counts as dc + 1. (Dc in the top of the next ch-space, ch 1) 5 times. 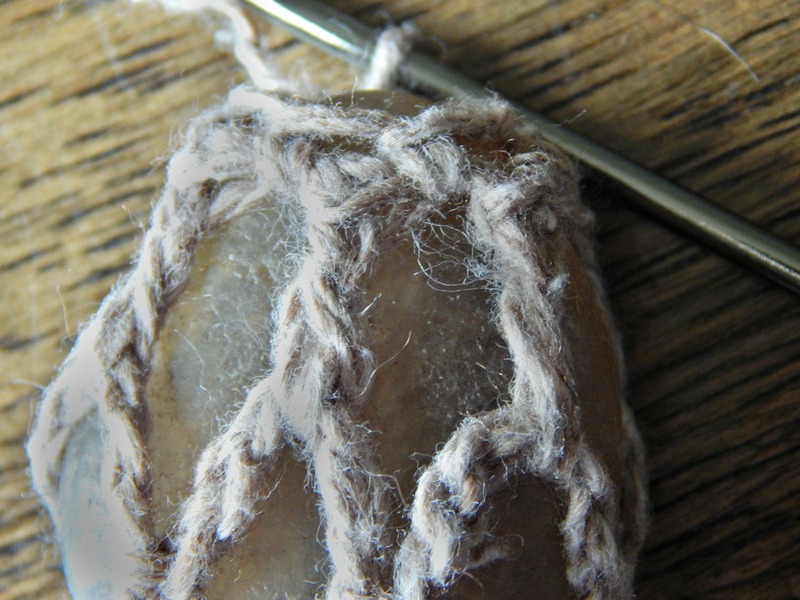 Before joining the end of this round, take your stone and slip it into the net, bottom centered against the middle of the motif. 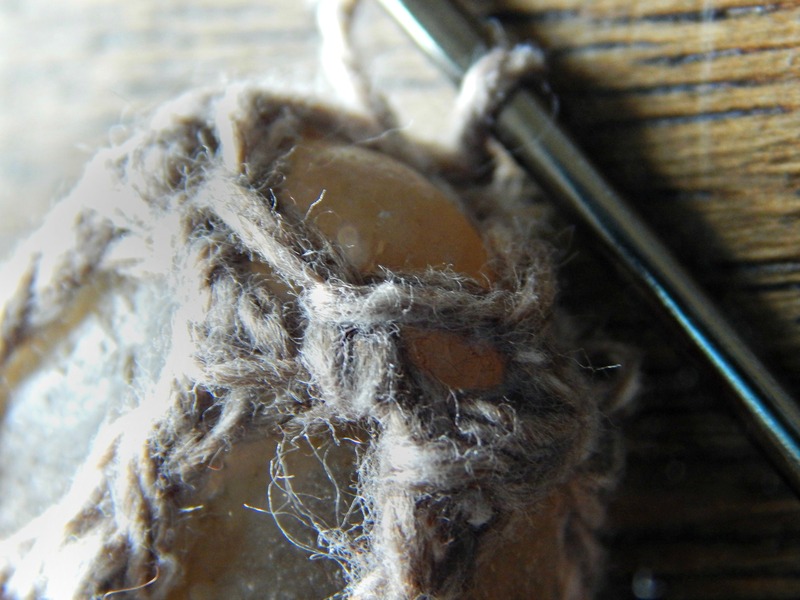 Join Rnd 3 to the 3rd ch of beginning ch-4 with a slip stitch, making sure to tighten securely. The net of the motif should be stretched almost to the top of the stone. Tug it into place, keeping the center of the motif aligned with the bottom. Rnd 4: Ch 1. (Single crochet in the next ch-1 space) 6 times. Join with a slip stitch to the first sc of the round. You should have a ring of 6 sc at the very top of your stone. Skip 2 stitches. Insert your hook in the next stitch, work a sc. *** In the bar at the side of the single crochet stitch (the outside loop, at the base) insert your hook and draw up loop. Yo and draw through two loops on the hook – 1 double chain stitch made. For a photo-tutorial on the Double Chain stitch, click here. ***If you prefer to work regular chain stitches for the cord, skip the rest of the paragraph. I prefer double chain as it is sturdier, prettier, and more elastic. Double chain 120 – 150 stitches (depending on how long you want your cord to be – just make sure it will fit over your head) and join back at the base stitch without twisting. This forms your cord. Cut yarn. Move to the base of your stone, where you left the long beginning tail hanging. 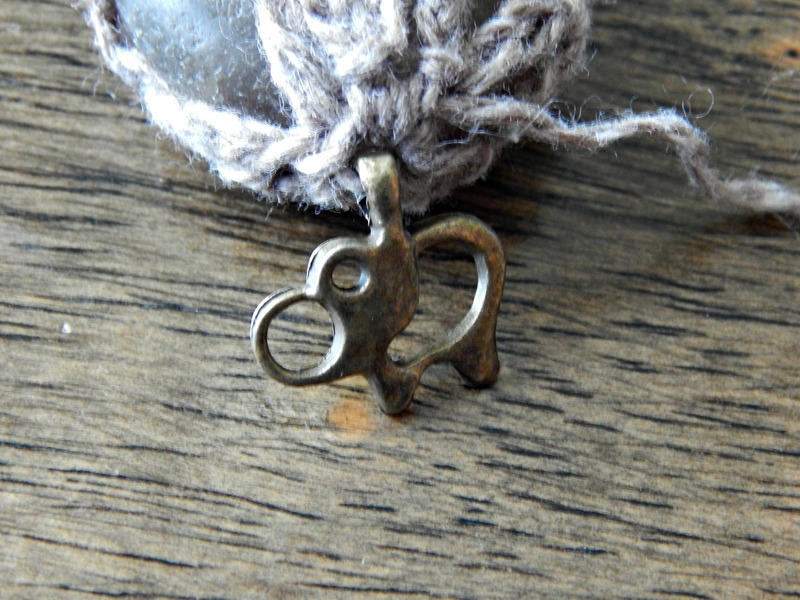 Thread your embroidery needle or tapestry needle with this tail and sew on your charm or beads. Weave in your tails with a tapestry or embroidery needle and you’re finished! This is a beautiful way to keepsake stones from your travels or from places special to you. And after that I felt confident enough to move on to using Lizbeth size 20 crochet and tatting thread and the dreaded 2.10 hook. Be careful… these might become addictive.